Scientists are looking into the cause of death of two whales found Friday — one a fin whale at Oakland's waterfront and the other a gray whale at Tennessee Valley Beach in Marin. The whale found in Oakland was partially submerged in an estuary near Jack London Square. The carcasses are the fourth and fifth, respectively, to be found in the Bay this year by the Marine Mammal Center, which rescues animals across 600 miles of state coastline. Dave Zahniser, rescue and response manager at the center, says whales may be found close to shore because of migratory patterns or food sources. "We'll see animals in areas where we haven't seen them in decades simply because that's where food moved at this particular time," Zahniser says. "If that happens with areas of high human activity, we're going to have more interactions." Whales commonly die from malnutrition, collisions with ships and entanglement in rope or fishing nets, according to researchers. Three gray whales have recently been struck by ships, says Zahniser. The Marine Mammal Center reported that on Wednesday, May 16, a ship entering the bay had a deceased whale draped across its bow. Zahniser says it may be the same whale that was found in Oakland. 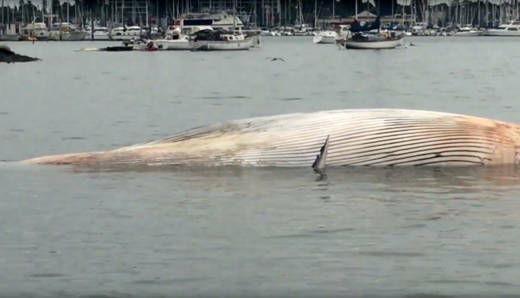 The fin whale is being towed to Angel Island State Park, where scientists can examine the carcass early next week to determine its cause of death. Afterwards it will likely be left to its natural decaying process at Angel Island. The gray whale in Marin was, “apparently hit by a ship with clear, precise cuts along its back and side,” says Mary Jane Schramm, spokesperson at the Greater Farallones National Marine Sanctuary. The Marine Mammal Center confirmed that scientists were on-scene Friday afternoon and plan to thoroughly examine the carcass on Saturday, May 19. Gray whales are making their annual spring migration from Mexico to Alaska and are the most frequently sighted whale in California, according to Schramm. Through March of this year, nine dead whales have been found along the California coastline, according to data from the National Oceanic and Atmospheric Administration. Last year there were 24 dead whales found in total.